Cynthia is currently looking into the conversion of non-edible (lignocellulosic) biomass waste to valuable industrial chemical feedstocks. She is particularly developing a more sustainable approach for the valorisation these wastes materials (such as pine needles from used Christmas trees, sugarcane bagasse and corncobs). This work is funded by the Schlumberger Foundation and supervised by Dr. James McGregor. 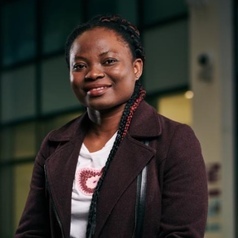 With keen interest in waste utilisation, some of Cynthia’s past researches include “Production of Diesel Fuel from Plastic Wastes” and “Conversion of Waste Vegetable Oils into Bio-diesel”.